Himalaya is an encounter between East and West. Indian ragas and jazz, sublimes Bengali vocals, African colours and psychedelic sounds, wonderful dances and fascinating images, atypical instrumental combinations including sitar, harp, saxophone, mridingam, flute, derbuka, guitar, tablas, harmonium, … create a magical universe. 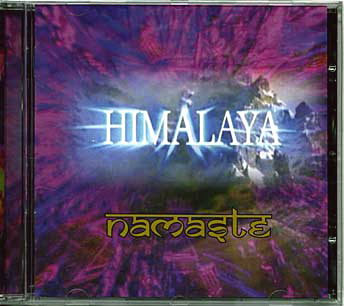 Serene meditative atmospheres, intimist climates, strong melodies, intensity and joy, exalting and dancing rhythms contribute to make Himalaya‘s music unique. Himalaya is a subtle journey intermixing music, dance and images embracing different cultures, periods, emotions, thoughts, styles, philosophies, sensibilities, expressions and impressions, … rich and deep also by the contribution of each member of the group who brings his/her personal experience as a result of a long artistic, intellectual and human path. Beginning 2007, Pierre Narcisse has got a thrombosis and is half paralysed. Due to this, he is not able to play and is replaced by Fabrice Colet. The Himalaya adventure starts in 1994. The basic idea was to confront and unite music from different cultures and create a music that leads to peace and harmony. At first Himalaya was a totally instrumental and acoustic quartet: acoustic guitar - saxophone, harp - flute, double bass and tabla. A first change was a new bassplayer - Eric Moens, next came the early compositions with sitar. Vocals were introduced when John Litton Baroï joined the group in 2002. During all these years, scattered with some periods of scenic inactivities, the music has ripen well and evolved a lot. New compositions and arrangements appeared and the instrumentation went a new direction introducing synthesizer, electric bass and guitar, electro-acoustic harp and in 2004 a new dimension came, the project opened up for dance performance with the venue of Sumi Lea Hordijk. And finally in 2006 and 2007 new developments are concretized making Himalaya an audio-visual performance with the contribution of video projections. The compositions of Himalaya form a tissue in which improvisations and written parts are interwoven. The principal sources of inspiration are Indian music and jazz, in which improvisation takes a primordial place. Filled with the essence of these cultures, the music of Himalaya gives large space to developpements of themes conceived over unusual rythmic structures (for the actuel occidental listener), through elaborated improvisations. Other sources are Africa with the multirythms and repetitive hypnotical forms that can provoce trances (in a different way also found in Indian culture), and several kind of Eastern as well as Western folk music. You will also hear some reminiscenses of Occidental medieval and Renaissance music. This all is seasoned with actual music styles like the large palette of rock, pop, … among others by the use of specific psychedelic effects and sounds. Many of the Himalaya compositions are based on the classical construction of ragas. This concerns the modes as well as other particular caracteristics. Another exemple is the use of tihai's (asymetrical phrases played three times, ending on the first beat of the next cycle) at the end of an improvisation and/or before passages leading toward other tempi, solists or themes. Himalaya often uses uneven metrics. The rythm patterns and bass lines are build naturally and the audience is not disconcerted by it, all on the contrary, the non-informed listener will probably not even remark that it is not a usual 4/4. On the other hand the particuliar sensations these rythms provoce will not loose their effect. Many of these uneven metrics have an Indian origine like rupaktal in 7 beats (3+2+2), jhaptal in 10 beats (5+5). There is also dadratal in 6 beats (3+3), teental in 16 beats (4+4+4+4). Also other kind of rythms, for exemple in 9 beats or in 3½ beats are used. The traditionnal 4 beat rythm is of course also present. The very particular and original sound of Himalaya is among other factors a result of an uncommon instrumentation : sitar, harp, guitar and bass concerning the string instruments, flute and saxophone for the winds, synthesizer (used in the alaps) and drums, tabla, mridingam and other percussions to complete the rythm section on one hand and on the other the main male voice with the typical Indian vocals in Bengali, accompagned by the traditional harmonium and using the specific turns of phrases and particular techniques of different Indian musical styles. In some compositions one or two feminine voices are added to this.The combination of these instruments and voices creates a very rich and profound soundscape. On the crossroad of West and East. Being born in the East (Indonesia) and grown up in the West it is very natural and evident for Sumi Lea to express - manifest her multicultural roots and background through dance and music. She has also acquired a lot of experience by working often with African musicians and dancers. Adding to this the influence of modern Western dance you obtain a serene >< explosif mix that fits perfectly with the music of Himalaya. The dancing has a similar construction as has the music, begining from quasi rest / silence, a restrained expression, progressively blossoming and edificating (unfoldment / development) towards a gradually intensifiyng expression.